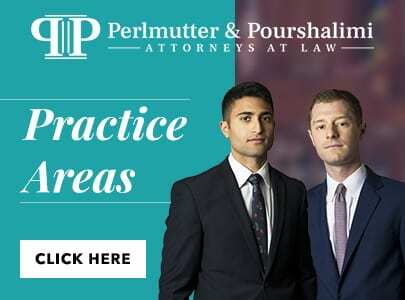 Can I Afford to Hire Perlmutter & Pourshalimi? Yes. We keep our prices fair and affordable with the goal of delivering exceptional value for your money and earning your repeat business. We offer flexible billing arrangements to make sure you can afford the representation you need right when you need it. It depends on the type of case you are pursuing. We handle personal injury cases on a contingency fee basis, meaning there is no payment due until after we win your case. If we don’t win your personal injury case, you don’t pay. In a lemon law case, you will have to pay upfront but if you win, the car manufacturer will have to repay all your attorney fees and costs. Other types of cases do require a retainer and/or hourly payment as the case progresses. What If I’ve Been Offered a Settlement Already? If you have been offered a settlement by the insurance company, do not accept it without first consulting a personal injury lawyer. Initial settlement offers are almost always extremely low. They may not cover all your future medical needs, much less account for your pain and suffering. The best way to ensure you do not accidentally accept an unfairly low settlement offer is to have an attorney go over the facts of your case, estimate the value of your damages, and negotiate for a better offer. When’s the Best Time to Call a Criminal Defense Lawyer? Immediately. If you even think you might need a criminal defense lawyer, you should contact us to talk about what’s going on. We can be present during police questioning to protect your 5th Amendment rights as well as begin working proactively to gather evidence that may prevent you from being arrested or prevent formal charges from being filed. In the event that you are arrested and charged, we will have a head start on our preparations for fighting the allegations in court. What If I Want to Plead Guilty? You still need a criminal defense attorney! Without an attorney, you will be at the mercy of the DA and prosecutor as to what penalties you will receive in exchange for your guilty plea. Your attorney can advise you regarding the fairness of any plea deal you are offered and negotiate on your behalf to make sure you receive the most lenient penalty the prosecutor can offer. What If I’ve Already Been Convicted? There are a variety of ways that Perlmutter & Pourshalimi can help if you have already been convicted. For example, we can review your case to see if there may be grounds for an appeal. Alternatively, we can help you seek an expungement or other form of post-conviction relief. Drug diversion is a process that allows certain nonviolent offenders to complete probation and drug treatment instead of jail time. Upon successful completion of the drug diversion program, the offender can have their drug conviction dismissed. A Miranda warning is a pre-interrogation warning that must be given to anyone in police custody. It serves to advise you of two very important rights: your right to remain silent, and your right to an attorney. In cases where the defendant was not properly Mirandized, it may be possible to get anything they told the police thrown out of evidence. The 4th Amendment protects us against illegal search and seizures. This means that in order to search your person, your vehicle, or your residence, the police must either have your permission or a warrant signed by a judge, or a valid warrant exception must apply. If not, any evidence obtained will not be admissible in court. How Do I Know I Have a Lemon? If your new or used car has undergone at least two unsuccessful attempts to fix a problem, it may be a lemon. You can seek a remedy under California’s lemon law regardless of the age of the vehicle, the mileage, or whether you bought it new or used. All you need to prove is that you bought the car from a dealer and it had problems that were covered by the warranty. A successful lemon law claim can result in a buyback, a replacement vehicle, or a cash settlement. Does California Lemon Law apply to my used vehicle? Yes. California Lemon Law applies to used vehicles if they were purchased from a dealer and were covered by warranty. Should I contact the manufacturer first, or give the dealership another chance to repair my vehicle? No. If your dealership has had a reasonable number of opportunities to repair the problem (at least two), then your vehicle is lemon and you may be entitled to compensation. If the dealership hasn’t been able to fix the problem after multiple opportunities to do so, they most likely won’t be able to fix it at all. In fact, the dealership or manufacturer is the only one to benefit if they stall and delay you from filing a claim. Is the dealership allowed to keep my vehicle for longer than 30 days to repair? No. Call us immediately if this happens to you. A manufacturer or authorized repair shop must complete all repairs within 30 days unless there’s a circumstance beyond their control. It may be a violation of California lemon law to fail to repair your vehicle within 30 days. Do I Really Need a Lawyer for My Lemon Law Claim? Yes. Car manufacturers typically do not treat individuals well when they attempt to stand up for their own rights. They may unfairly deny your claim or delay its processing until it is too late for you to take the additional steps that may be needed to secure compensation. With a lemon law attorney on your side, the car manufacturers will take your claim much more seriously and you will have a much higher likelihood of success.